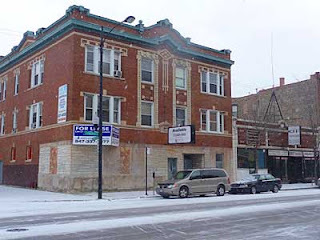 The two buildings at 1916-24 W. Chicago continue to be topics of community discussion. The properties would have been razed for condominiums in an unsuccessful 2007 proposal. Both addresses came up in a meeting that Ald. Manny Flores (1st Ward) called Feb. 26 to get neighbor feedback on the 1916 property. Flores said he had not yet made a decision. CD One Price Cleaners and landlord Kenneth Lebovic both have asked the East Village Association to revisit its recommendation that Flores not allow a dry-cleaning plant there despite the prevailing storefront zoning. Board members feel the issue was thoroughly aired before the January membership vote. The alderman's meeting discussed parking and environmental concerns with about a dozen neighbors. The newer chemical One Price uses is a neurotoxin and skin and eye irritant, but less toxic than traditional solvents and handled in cartridges for safety. Flores rejected claims that this was a "green" process, but said the Environmental Protection Agency and city fire Department had no issues with the plant. Flores also discussed The Winchester Bar next door. The original request involved a zoning change, an incidental liquor license, an amusement license and the right for a rooftop deck. Flores said he would not support a rooftop idea or anything with Bar or Tavern in the name. Neighbors voiced concerns about prospects of DJ entertainment and the overall size of the establishment, which would compete for scarce parking even with a valet on site. It is surprising to me that a known business person wants to open such an enormous place in this economy. How do you fill a huge place in a bad economy? How do you sell $15 martinis when people cannot afford their mortgage? It is also surprising to me that they would portray themselves as new business people, funtioning as a family business---when they have a track record....why would they do this in writing? They obviously care nothing for the neighborhood or they would not be planning on a PPA license. PPA licenses have proven to nothing but bad news when they are placed near residential areas. What I have to wonder about is the effect the dry cleaning may have on the food? I wouldn't eat or drink there for anything. The neighborhood should be eager with the improvements to the area and realize the risk involved due to the economy. I don't think they are planning on selling expensive drinks or having a pricey menu. As for the amusement license I heard they backed off for now to prove to the area that they are not opening a night club. They are still going forward so I guess they are legit and stand up business people. I hope it turns out well so I can kick back to a nice place down my street. The idiot on top should get a second job to pay for his mortgage instead of posting nonsense. The cleaners was turned down.